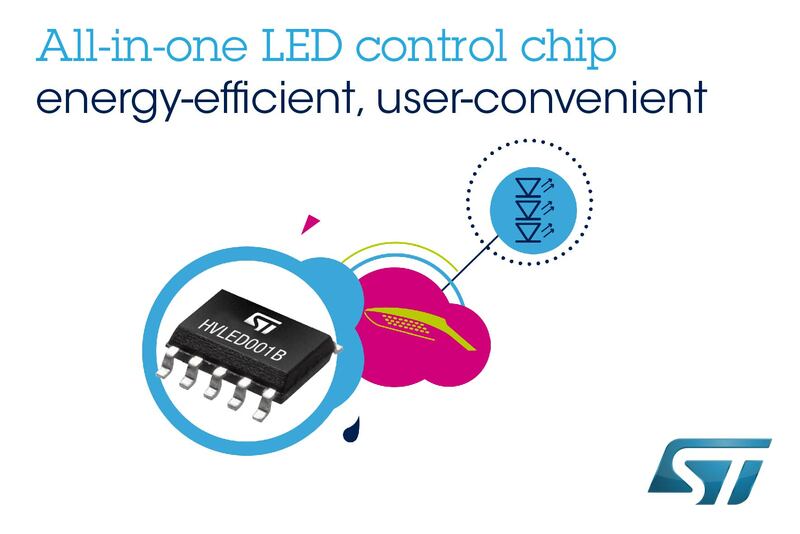 Geneva, February 12, 2019 - STMicroelectronics (NYSE: STM), a global semiconductor leader serving customers across the spectrum of electronics applications, has combined its cutting-edge LED-control know-how with advanced power technologies in a new all-in-one LED control chip that enables future luminaires to save more energy and deliver better user experiences. The HVLED001B controller simplifies designing LED-lighting modules, maximizes energy efficiency at all dimming levels, and ensures smoother brightness control. Lighting innovator TCI of Italy, a lead customer, has already designed forthcoming products containing the new chip to increase energy savings, safety, and usability. Explaining that to create mid- and high-power LED luminaires to satisfy the latest lighting regulations and market demands is no easy challenge, a technical spokesperson for TCI said, "ST's new LED driver enabled us to achieve our high performance targets, leveraging built-in features that simplify design and reduce the bill of materials. LED power-up is extremely fast, taking less than 0.4 seconds, and efficiency remains very high even at the lower dimming levels where conventional drivers can lose their edge." Matteo Lo Presti, Executive Vice President, Analog Sub-Group General Manager in ST's Analog, MEMS and Sensors Group, added, "As well as further improving energy efficiency under all operating conditions, the latest luminaires must support smart-grid management and power quality by increasing power factor and reducing harmonic distortion. The HVLED001B makes these targets achievable, at the same time as supporting improved start-up performance and dimming accuracy." The HVLED001B is the second generation of ST's LED driver family containing high-voltage startup and sensing circuitry that simplifies connection to the AC line.